Originally published in 1995 Positive Practice is for newcomers to the field of family therapy and systemic consultation including professionals from a variety of disciplines, such as psychology, psychiatry, social work, nursing, child care and protection, occupational therapy, paediatrics and general medical practice. 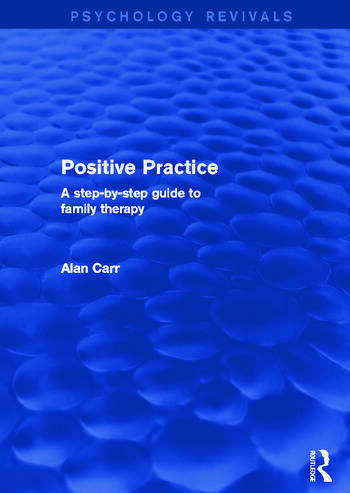 Positive Practice is a step-by-step approach to family therapy written both as a treatment manual and as a training resource. It describes in detail a unique approach to consulting to families with youngsters who have psychological or social problems. It covers the difficulties associated with planning the first consultation, strategies for family assessment and problem formulation, methods for developing a therapeutic contract and goal setting, plans for conducting therapy and troubleshooting resistance, and ways of concluding therapy. It includes many diagrams and checklists and is essentially jargon-free. Practical exercises are given at the end of each chapter, making it an ideal training resource for any introductory course. Special issues discussed include adjunctive individual sessions, convening network meetings, jointly managing statutory and therapeutic responsibilities, ethical decision making, clinical audit and professional development. An integrative formulation model provides a focus for both guiding assessment and planning therapy. The approach to practice described in this book offers clinicians a way to integrate new ideas from the burgeoning literature on family therapy, theory and research into their clinical work. Foreword. Preface. Acknowledgements. 1 Positive Practice as a Developmental and Recursive Process 2 Planning Who to Invite 3 Planning What to Ask 4 Developing an Assessment Contract 5 Assessment Part 1. The Cycle of Interaction Around the Presenting Problem 6 Assessment Part 2. History and Genogram Construction 7 Formulation and Contracting for Treatment 8 Goals 9 Tasks Between Sessions 10 Mid-therapy Manoeuvres: Relabelling, Reframing and Coaching 11 Managing Resistance 12 Written Communication 13 Therapeutic Dilemmas and Crisis Phonecalls 14 Individual Consultations and Talking to Children 15 Network Meetings 16 Disengagement 17 Ethical Issues 18 Service Development and Professional Development. References. Index.